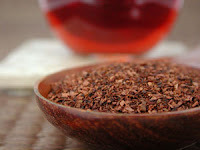 Organic Rooibos – Also known as Red Bush Tea, Rooibos (pronounced “roy-bus”) is a mineral-rich and highly antioxidant herbal beverage from South Africa. Naturally caffeine-free, its flavor is somewhat similar to black tea, though very low in tannins so it doesn’t turn bitter if steeped for too long. Rooibos is characteristically mild and aromatic with a slightly citric sweetness and is excellent hot or iced. This herbal tisane can also stand up to milk or sugar. Bourbon Vanilla Honeybush – Honeybush is another “bush tea” from South Africa and is naturally caffeine-free with a sweet honey-like flavor. Also a nice source of calcium, our version is flavored with genuine Bourbon vanilla. Richly aromatic, Honeybush is a delight at any time of day, and can be enjoyed with or without milk or sugar. Red Berry Fruit Melange – A fruity delight, the Red Berry Fruit Melange is composed of blueberries, black currants, elder berries, grapes and hibiscus. Packed full of vitamins and an excellent choice for kids and grown-ups alike!